January 23, 2019 Social JusticeLeave a Comment on Can worker participation on corporate boards fight income inequality? The original article appears on WhoWhoWhy.org. The issue of income inequality is front and center in the American conversation. A recent poll showed 66 percent of Americans agree that money and wealth should be more evenly distributed in the United States. Instead, the rich are getting richer and wealth gap is increasing. As the run-up to the 2020 election begins, there is one notable policy proposal to reduce income inequality — and it would not cost the taxpayers a dime. That proposal is codetermination: a system that allows employees at large corporations to elect members of the boards of directors [40 percent]. With workers serving as directors, it is argued they would be in a much better position to obtain higher wages for themselves and block excessive management compensation packages. Codetermination has been in effect in Germany, Scandinavia, and other northern European countries. And, if Sen. Elizabeth Warren (D-MA) has anything to say on the matter, it will be implemented in the US as well. Warren is the first major Democratic candidate to announce her plans to run for president, having set up an exploratory committee on New Year’s Eve. Her rhetoric foreshadows a campaign centered on anti-corporate populism and income inequality. “How did we get here? Billionaires and big corporations decided they wanted more of the pie. And they enlisted politicians to cut them a fatter slice,” Warren announced in a video sent to supporters. Employees would elect at least 40 percent of all company directors of these chartered firms, giving them representation on corporate boards. Executives who receive shares of stock as compensation would have to hold them for at least five years. The rationale for this measure is to ensure that decision-makers focus on the long-term interests of all corporate stakeholders — rather than enriching themselves on the basis of short-term gains in the companies’ share prices. Board members and shareholders would have to approve all political spending. Restoring a balanceThe main selling point for Warren’s federal chartering proposal has been a challenge for income inequality. Proponents view the requirement that employee-elected board members make up 40 percent of corporate directors as a needed check on the power of capital. “My bill will help the American economy return to the era when American companies and American workers did well together,” Warren declared when the legislative proposal was rolled out last summer. Advocates note that for the bulk of the post–World War II years, labor shared in the growing productivity, with workers’ living standards rising during the postwar boom. That began to change in the 1970s. Despite continued economic growth and productivity, wage rates flattened out. Advocates point out that over the last decade, big American companies have dedicated 93 percent of earnings to shareholders — redirecting trillions of dollars that could have gone to workers or long-term investments in these corporations. 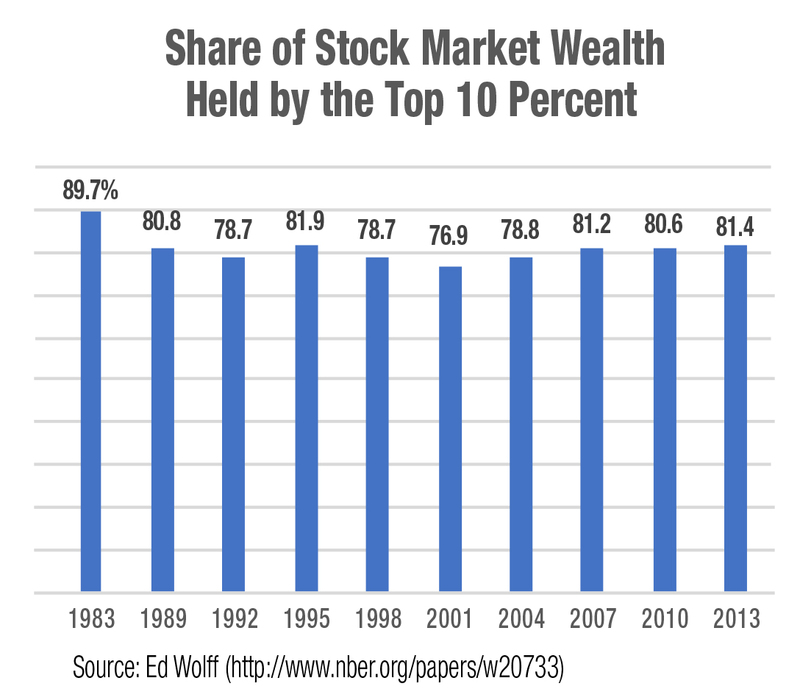 Eighty percent of the value of stock is owned by only 10 percent of the population, and half of Americans own no stock at all. This has accelerated the trend towards greater inequality. And, according to progressive economists, this tunnel-vision dedication to short-term shareholder profits has had other consequences. “Too much money, chasing too few assets had led to asset inflation and financial volatility. And too little capital invested in productive investments,” Robert Hockett, a co-author of the Warren bill, told WhoWhatWhy. Supporters of the bill view the German codetermination system as a model. They point to the strong German economy, where income differentials between CEOs and rank-and-file workers are much smaller than in the US. Less inequality translates into a stronger middle class and more consumer purchasing power, according to the bill’s proponents. Not surprisingly, the bill has many detractors on the right. They view the move to increase the power of other stakeholders — such as workers, consumers, and communities — as a step in the wrong direction. Companies that are well run already take into account all the potential stakeholders, including employees, according to Black Entertainment Television co-founder Robert Johnson, who argued that the proposal “is a solution in search of a problem that is absolutely not necessary.” Johnson also maintained that by putting government in the middle of how corporations are run would be a slippery slope toward a socialist economy. “It feels to me as if she (Warren) is looking across the ocean, and sees these other models, and is trying to copy and paste them onto the US, weirdly detached … on how these models have failed,” Samuel Hammond, director of poverty and welfare policy at the Niskanen Center, told WhoWhatWhy. The Niskanen Center, based in Washington, DC, describes itself as a think tank that advocates for environmentalism, immigration reform, civil liberties, and a national defense policy based on market principles. It was named after the late William A. Niskanen, a former economic adviser to President Ronald Reagan. The bill’s detractors argue that the legislation’s requirements would make companies unable to respond to the pressures of the marketplace. One example of this is when Steve Jobs returned to Apple in 1996. Jobs’s decisive actions in shuttering unproductive divisions and laying off thousands of workers, as well as replacing corporate directors, was credited with turning the company around. “It’s simply impossible to imagine Jobs’s unilateral vision succeeding in an environment of constant stakeholder management and worker negotiations,” Hammond argued. But codetermination’s supporters claim that, since their livelihoods depend upon it, workers have just as much stake in ensuring that the company stays healthy as does management. Shorter hours, temporary pay cuts, fewer overtime hours, and the more productive use of the existing workforce have all been supported by workers at different companies, if it was seen as necessary to keeping them in business, Hockett said. Another objection by opponents is that it represents nothing less than the conversion of the modern private corporation into a public institution. “This raises the question of why we have private corporations in the first place,” Hammond asserted. The duty of directors is to make money for shareholders … but not at the expense of the environment, human rights, the public health and safety, the communities in which the corporation operates or the dignity of its employees. Europe’s economic record: A model or a warning? Advocates of the Warren bill cite the productivity and equality in Western European and Scandinavian economies as a model. Those nations are the ones that look the most like what Senator Warren is trying to bring about, Hockett claimed. “The European economies that have not done so well, are primarily Southern European economies and Eastern European economies. Those are the ones that look the most like us,” Hockett said. In fact, supporters note the German economy’s annualized growth in real per-capita gross domestic product since 1976 has been more robust than that of the US. Detractors claim the US is a better model for economic growth than Western Europe or Scandinavia. “The United States is home to 64 percent of the world’s privately held companies and a plurality of the world’s billion dollar startups … they are the reason America remains the engine of innovation for the entire world,” Hammond stated. Critics note that in 2005, while under codetermination, when the German firm Volkswagen long had employee-elected board members, scandal struck the firm.Members of their supervisory board were caught exchanging favors, including access to prostitutes, in exchange for union-member board votes. Opponents also argued that the Volkswagen union board members were ineffective in preventing the more recent emissions scandal and protecting the public interest. However, it may be a tough sell to tout the public interest records of companies without codetermination. And, Hammond cited statistics showing that over half of German employers technically eligible for codetermination don’t have it. “The pressures of globalization are pushing companies to adopt a more American model,“ Hammond said. In the Progressive Era — a period of social activism and political reform in the US spanning the 1890s to the 1920s — Presidents William Howard Taft, Woodrow Wilson, and Teddy Roosevelt all endorsed federal chartering to rein in the power of the trusts. During the 1930s, Wyoming Sen. Joseph O’Mahoney held extensive hearings on the topic and drafted legislation that required large corporations be chartered by the federal government. After agitation by many progressive groups in the mid-1970s, the Corporate Democracy Act was introduced by then-Congressman Ben Rosenthal in 1980. But with the advent of the Reagan revolution, this effort got little traction. All four versions of federal chartering legislation reflected the concerns of the times. Federal chartering proposals in the Progressive Era and in the 1930s stressed their anti-monopoly provisions. The Corporate Democracy Act of 1980 stressed making corporations more responsive to the communities they affected. This may have been in response to the discovery of toxic chemical time-bombs around the nation. The Love Canal neighborhood in Niagara Falls, NY, became emblematic of environmental disaster. Hundreds of families exposed to toxic chemicals there eventually had to be relocated. And, as cited earlier, Warren’s version highlights its impact on fighting income inequality. In early 2018 a poll by Civis Analytics showed the general public supported, by a greater than two-to-one margin, the idea of employees at large companies electing representatives to the board of directors. There was even support for the idea among many Republican-leaning voters. In another sign of codetermination’s potential popularity, one of the recent demands by Google strikers was that an employee representative be seated on the Google board of directors. Warren has sometimes been compared to the late Republican Congressman and vice presidential candidate Jack Kemp as an innovator and idea leader in her party. And the comparison between the two may not end there. Before the sweeping Reagan tax cuts were passed in 1981, Kemp rolled out his own tax-cut proposal before Congress and the public in the late 1970s. Kemp knew the then-Democratic majorities in Congress would never enact his proposal. But many historians believe his efforts laid the groundwork for the bill’s eventual passage when Reagan came to power. The same strategy appears to be at work behind Warren’s roll-out of the Accountable Capitalism Act, and other progressive proposals as well. Those other progressive proposals which are being “field tested” in the current US Congress include the “Green New Deal,” the “Stop Walmart Act,” and a $15-an-hour minimum wage. There appears to be some momentum on the Hill for the Accountable Capitalism Act. A few weeks ago, a broad coalition of Democrats in the House announced their support for the measure. Supporters are “planting the flag” now with these proposals so that, should the Democrats sweep Congress and the White House in 2020, the new bills will be “shovel ready” to be passed into law. Next Alexandria Ocasio-Cortez’s 70% Tax Proposal Is a Great Start—But …..